The Bangalore Metropolitan Transport Corporation (BMTC) on Thursday (February 27, 2014) unveiled the country's first electric bus. The 12-metre-long air-conditioned ‘e-bus’ can accommodate 32 people, including the driver and a wheelchair occupant, and can travel 250 km on a single charge of four to six hours. The BMTC will use the electric bus on a trial basis for three months and, based on the success of the operations it will be expanding the services. 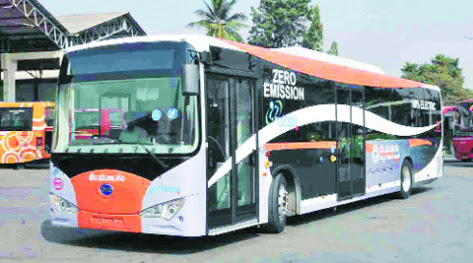 Manufactured by BYD, a Chinese coach company, the emission-free bus costs Rs 2.7 crore against Rs 1.3 crore to Rs 1.7 crore for a Volvo A/C bus. The Growth of Automobile industry in India is only after the independence. The first automobile industry was established at the Premier Automobiles Ltd. at Kurla (Mumbai) in 1947 and the Hindustan Motors Ltd. at Uttarpara (Kolkata) in 1948. The manufacture of various automobile parts has progressed very fast in India. A new life has been given to this industry with the manufacturing of various automobile parts. Among the production of two-wheelers, Motor Cycles are manufactured at Faridabad, Haryana and Mysore. While Scooters are manufactured at Lucknow, Satara, Akudi (Pune), Panki (Kanpur) and Odhav (Ahmedabad). The cars produced at Haryana, Kolkata, Mumbai and Chennai are Maruti, Ambassador, Fiat, Ford and Hyundai etc. MUMBAI: The much-anticipated Mumbai Monorail – the first in India – was inaugurated in Mumbai today (01-02-2014), with Chief Minister PrithvirajChavan, Deputy Chief Minister Ajit Pawar and several media persons climbing aboard the inaugural ride. The 8.93-km-long Monorail, running between Chembur-Wadala in the east-south direction, comprising the first phase, will be open to the public from 02-02-2014, while in the second phase the services will be extended to SantGadge Maharaj Chowk in South Mumbai. The monorail project has been executed by a consortium of engineering major Larsen and Toubro Ltd (L&T) and Malaysian firm Scomi Engineering and owned and operated by Mumbai Metropolitan Region Development Authority (MMRDA). 0G-Mobile radio telephone (also known as “0G”). Mobile radio telephone systems preceded modern cellular mobile telephony technology. Since they were the predecessors of the first generation of cellular telephones, these systems are sometimes retroactively referred to as pre cellular (or sometimes zero generation) systems. 1G refers to the first-generation of wireless telephone technology, mobile telecommunications. These are the analog telecommunications standards that were introduced in the 1980s and continued until being replaced by 2G digital telecommunications. The main difference between two succeeding mobile telephone systems, 1G and 2G is that the radio signals that 1G networks use are analog, while 2G networks are digital. 2G is short for second-generation wireless telephone technology. Second generation 2G cellular telecom networks were commercially launched on the GSM standard in Finland by Radiolinja (now part of Elisa Oyj) in 1991. 2G technologies enabled the various mobile phone networks to provide the services such as text messages, picture messages and MMS (multi media messages). All text messages sent over 2G are digitally encrypted, allowing for the transfer of data in such a way that only the intended receiver can receive and read it. 3G stands for third-generation and refers to technology that allows mobile phones to access the internet – from surfing web pages to making video calls and downloading music. 3G telecommunication networks support services that provide an information transfer rate of at least 200 kbit/s. 3G finds application in wireless voice telephony, mobile Internet access, fixed wireless Internet access, video calls and mobile TV. General Packet Radio Service (GPRS) is a packet oriented mobile data service on the 2G and 3G cellular communication system’s global system for mobile communications (GSM). GPRS provides data rates of 56-114 kbit/second. 2G cellular technology combined with GPRS is sometimes described as 2.5G, that is, a technology between the second (2G) and third (3G) generations of mobile telephony. 4G is the fourth generation of mobile phone mobile communication technology standards. It is a successor to the third generation (3G) standards. A 4G system provides mobile ultra-broadband Internet access. Conceivable applications include amended mobile web access, IP telephony, gaming services, high-definition mobile TV, video conferencing, 3D television, and cloud computing. 5G (5th generation mobile networks or 5th generation wireless systems) projects to denote the next major phase of mobile telecommunications standards beyond the current 4G/IMT-Advanced standards. 5G is also referred to as beyond 2020 mobile communications technologies. 5G does not describe any particular specification in any official document published by any telecommunication standardization body. Taiwan has become the first country in the world to offer free WiFiconnectivity to its citizens and all its foreign tourists. Wi-Fi (also spelled Wifior WiFi) is a popular technology that allows an electronic device to exchange data or connect to the internet wirelessly using radio waves. The name (Wi-Fi) is a trademark name, and was stated to be a play on the audiophile term Hi-Fi. The Wi-Fi Alliance defines Wi-Fi as any “wireless local area network (WLAN) products that are based on the Institute of Electrical and Electronics Engineers’ (IEEE) 802.11 standards”. The Wi-Fi Alliance initially used the advertising slogan “The Standard for Wireless Fidelity”, for Wi-Fi but later removed the phrase from their marketing.